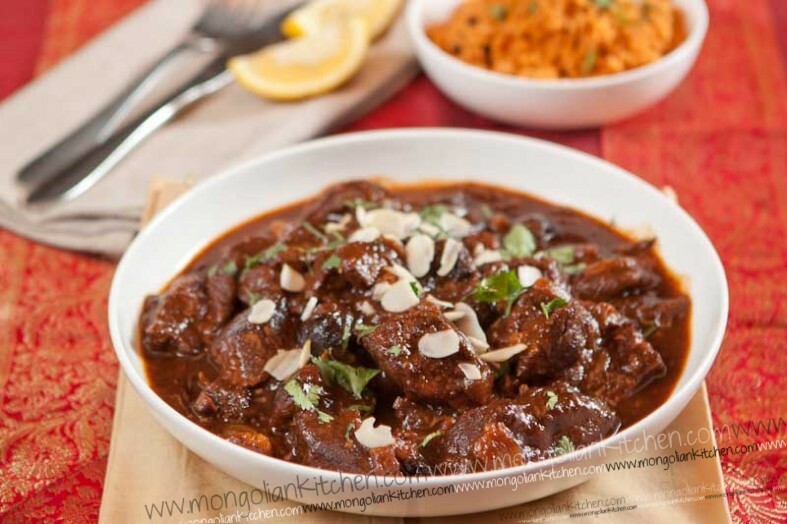 We love Moroccan flavours at Mongolian Kitchen..we always say it..spicy and slightly sweet really works well with our tastebuds. Lamb can be quite a strong meat to cook with. Not everyone likes it but a good way to cook it is for a long time, slowly. 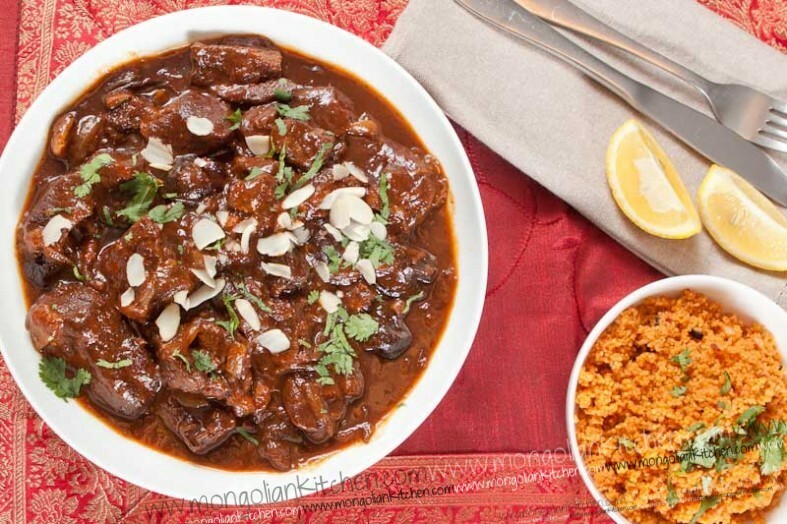 So what better way than a braised lamb stew with Moroccan flavours? The key flavours here are Rose Harissa and Ras El Hanout which give the aromas and spices of Morocco and Dates and Apricot Jam to give a sweetness. Lemon zest adds a zingyness and a rich beef stock makes the whole thing blend together. This dish was served with cous cous as wel always do with moroccan but you can also serve with rice or bread. It takes time to slow cook and you could also try making it in the slow cooker. 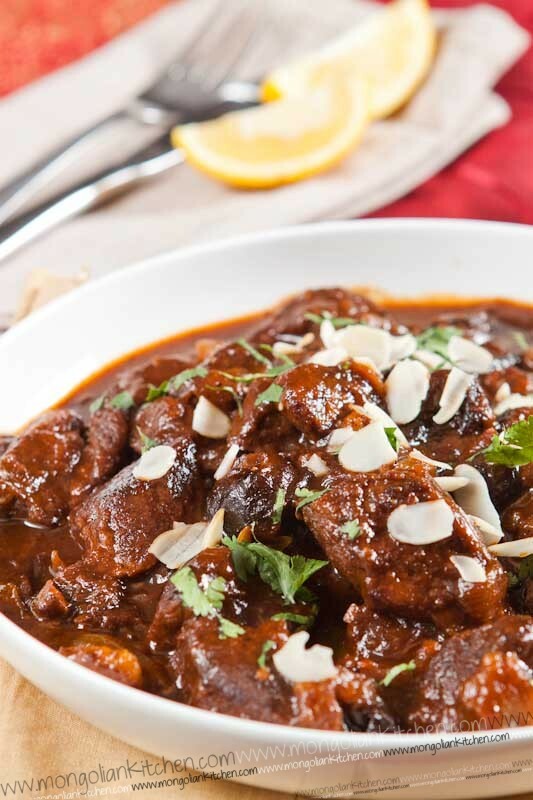 Tender slow cooked lamb in Moroccan spices (Rose Harrisa and Ras El Hanout) with sweet flavours added from Dates and Apricots. Chop the lamb into thick chunks (as we will be cooking for a while it needs to remain largish to stay together. Heat your pot till hot. Add a little olive oil and brown the meat on a high heat for around 5 minutes. Once browned remove and set aside. The pan should have nice colouring from the lamb and spices. Turn the heat down allowing the pot to cool a little. Add the rest of the ras el hanout, rose harissa, paprika, cumin and turmeric and fry for 2-3 minutes. Deglaze the pot with the Marsala and allow the alcohol to cook off for 2 minutes. Add the lamb and the lemon zest, apricot jam and dates. Pour over the stock until it just covers the lamb. Add more water to cover the lamb if required. Oven Casserole Dishes work best for this and make sure it is one that can be used on the hob too. 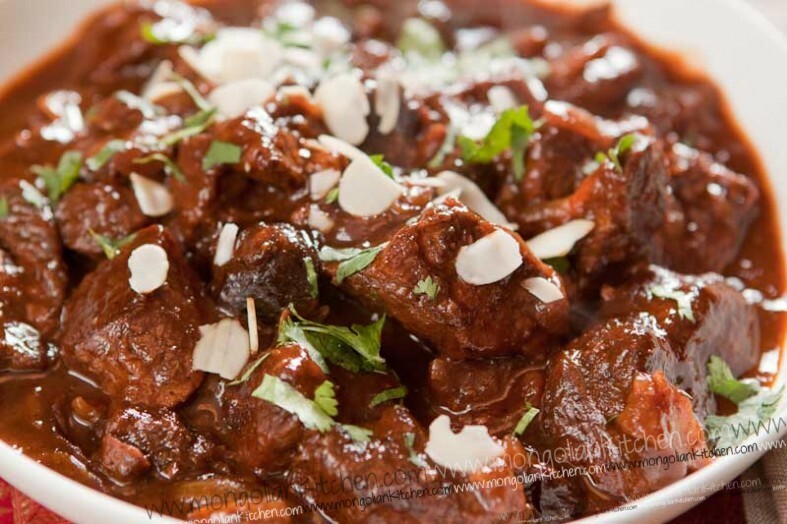 I am looking at the morrocan lamb recipe and I was wondering if the quantity of dates is correct. 2 teaspoons seems a little small. im cooking morroccan lamb for 8 on sunday should i tripple ingrediants. Hi Sharon..sorry about the late reply..we were on our hols!! You don’t really need to triple all the ingredients. In fact you don’t need to be that precise since its a braising type of cooking. All you need to do is add more liquid and stock so that it covers the lamb. The rest of the ingredients just add a little bit more that we have..
Re the moroccan lamb, should the Marsala / port be a sweet or dry? Apparently there are lots of types. Also one cup (a third of a bottle) seems really expensive, is there an alternative? Hi Steve, the port or Marsala wine should be sweet. Half a cup of wine will new plenty. Yo can also use red wine as cheaper alternative. Enjoy. I love this recipe! I cooked enough for 10 people and followed the instructions exactly, and it was perfect. Everybody loved it and wanted more. Very tasty indeed. Just found your Moroccan Lamb recipe, sounds great, can some of the lamb be substituted with chickpeas and if so what proportions and at what point in the preparation? Hi Mick, you can add about a third of the amount in chickpeas to start with and alter to your taste. If you’re using tinned chickpeas then add no more then 10 mins before the end of the cooking time to avoid over cooking. Good luck and enjoy.